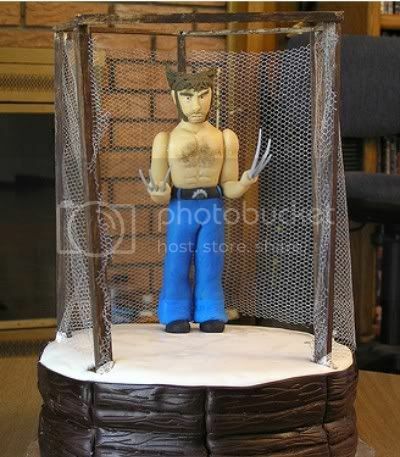 For the birthday of her friend Roslee (a “BIG Hugh Jackman fan”), it occurred to confectionery artisan Kathy to combine three of every man’s favorite things: double-layer cake, Wolverine from the X-Men, and cage matches. If this is what Kathy does for her girlfriends, what do her guy friends get for their birthdays? Steroids and a jack-hammer? Wolverine (who ended up looking more like the comic book version than Handsome Hugh, thanks in large part to July humidity) is several glued-together pieces of solid Wilton fondant, hand colored with food gels (yes, even the claws; boy was THAT fun…). 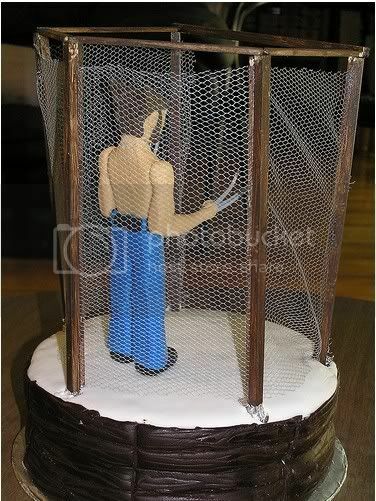 The fight cage is made from painted dowels strung with large gauge bridal veil mesh spray-painted silver. The boards and floor of the cage base (ie., the cake) are untinted Satin Ice vanilla and dark chocolate fondant (mmm–tastes like marshmallows and moonpies…). I love it when a cake looks at me, angrily. It increases my consumption satisfaction by tenfold. His belt buckle is patterned loosely after the one Hugh Jackman was wearing in the cage match scene of the first X-Men movie. The figure alone took about five hours over a couple of days, and the cage took another two or three, also spread out over a couple of days, not including glue drying time. For the past 10 years, I have presided over The Green Slime Awards, which ‘honor’ the most wretched SF/F/Adv/Horror of the year, at a small regional literary con called Bubonicon. Thanks to my buddy Pete at /Film for spotting this cake in the first place, and thanks to Kathy for sharing the awesomeness. You can check out more of her “novelty cakes” in her Flickr photostream, and she said to tell you that she welcomes inquiries and comments at nightbirdcraft at aol d0t com. Yes, she still uses AOL. Do not judge her too harshly. 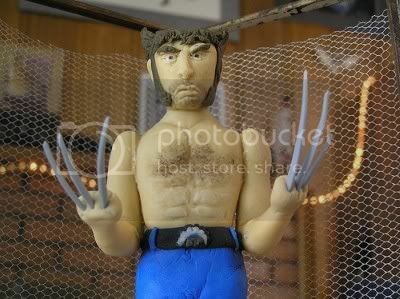 Anyone who can make a cake with that much awesomeness (and have a fully edible wolverine) can be forgiven for an aol.com email – even by the most ardent geeks. hmmm…what IS that chest hair made of? Ohhh and she goes to Boubonicon. That is in New Mexico. That cake is surprisingly pretty despite the heat it must’ve endured if it was transported in any vehicle, by foot, or was outside for any time. how I can buy this cake for friday june 19??? Hahaha. Yes, send the money to my Paypal. That will be 500 bucks. Actually, rush orders are $5,000. And must be transported by angry stork.